I knew in a moment it must be Nick the UPS man. "Now, Dasher! dammit, Dancer! now, Prancer and Vixen! On, Come on stupid! on, Donder and Blitzen! To the top of the porch! to ring the bell! Now run away! dash away! dash away all!" My apologies to Clement Clarke Moore. LOVE IT! Good job. Merry Christmas Chilibrown. The UPS man often plays Santa at our house, too. Happy Holidays! Was there a green egg in the box? I just had a bunch of cookies and eggnog. Whoops! 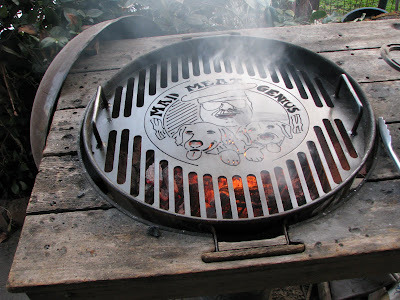 You need more outdoor cooking toys like I need more cast iron! Sure hope your BGE doesn't get hijacked on its way out to the Bay Area. I'll send pictures of it being used if it'll make you feel better. No Green Egg this year. I did get that 40 pound sack of lump charcoal. Ahhhh get to see it in action. Spectacular!